Of Kami and Buddhas: Tokyo’s Anime Temple! CNNGo reported today about the Ryohoji Temple in Hachioji, which has become an anime temple. 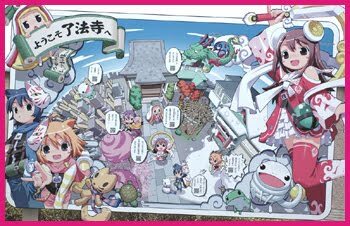 That’s right: anime temple, complete with a theme song, anime character, monks praying to the anime character, and…a maid cafe. The 16th century temple began its transformation when the chief monk tried to get young people to come to it. Since then though, the temple has become known as “Moe-dera” (“newly budding temple”), a reference to “moe” — a feeling of attraction to a blossoming young girl, usually a manga character — while “dera” means “temple. I’ve gotta say…I think I’m only surprised because of my personal connections with my faith, which I take seriously (sometimes too seriously). In Japan, religion is a “practical religion,” with plenty of room for syncretism and, in this case, the inclusion of pop culture. In other words, this is soooo Japan. Go to CNNGo for the article in its entirity. Also, check out the temple’s website, which has the to be the most commercial website EVER for a religious institution. So moe is the new holy? Ah… I remember this. There was a shrine that actually commissioned some illustrator to draw some banner for them to promote some event that was happening at the shrine. It shouldn’t be too much of surprise though. Just look at Lucky Star! I don’t actually mind these anyway. It’s all good fun, and many would agree that youngster these days have little to no practice of religious faith at all. This could just be one of the ways to appeal to the younger generations these days. While there are certain things to be concerned about, but as long as the message gets through, it should be alright. After all, Buddhism is about understanding one self and ultimately, harmony amongst the human race. Previous Post Of Kami and Buddhas: Domo, er….Shalom?